In many health regions, with hundreds if not thousands of physicians, the management of the delivery of primary care can be challenging. The Novari Provider Relationship Management module was developed in partnership with the Mississauga Halton Local Health Integration Network (MH LHIN) and gives regional health authorities a software tool designed to provide a detailed database of healthcare providers and a means to help manage these relationships. Using the system, regional health authorities can understand the number and distribution of healthcare providers within the region. Detailed profiles of each provider can be easily and accurately maintained, to include clinical areas of interest (i.e. palliative care, sports medicine, geriatric care, etc. ), number of patients, electronic medical record (EMR) system in use, etc. The module allows regional health authorities to document and track key physician touch points around important topics being communicated to the primary care physician community. Novari Provider Relationship Management can also be used as a communication tool to transmit email, eFax and SMS text messages to a subset, or a broadcast to all physicians (based on each physician’s notification preferences) in the region. Communicating effectively and keeping track of communications with a diverse primary care physician population can be challenging. 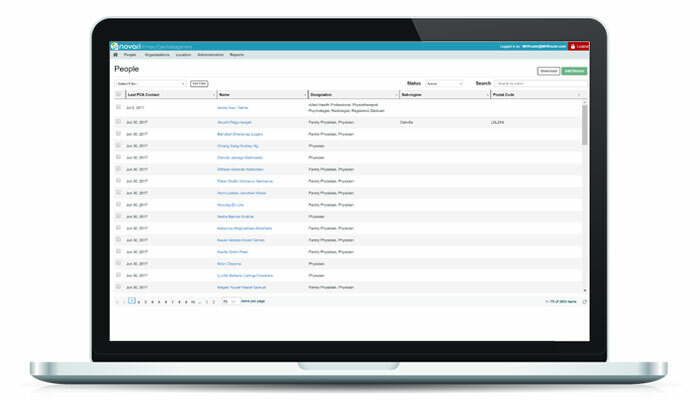 The Novari Provider Relationship Management module allows regional health authority staff to document each contact with a physician. In addition, the system can send messages to individual physicians, groups of physicians or broadcast messages to all physicians via fax, email and even SMS text messages (in accordance with a physician’s communication preferences). With detailed physician profiles, dashboards and reports, regional health authorities can better understand the delivery of primary care within their region. See at a glance; the distribution of primary care across the region, a list of physicians currently accepting new patients or a breakdown of physicians by sub-specialties. The system includes a detailed profile on every physician, including their various practice locations, EMR usage and areas of sub-specialty. Profiles can be mutually maintained by the regional health authority and directly by physicians. Some regional health authorities are deploying primary care field liaison staff. Their job is to build a relationship between the regional health authority and the primary care community, communicate important regional initiatives to the physicians and deliver feedback from the physicians back to the regional health authority. 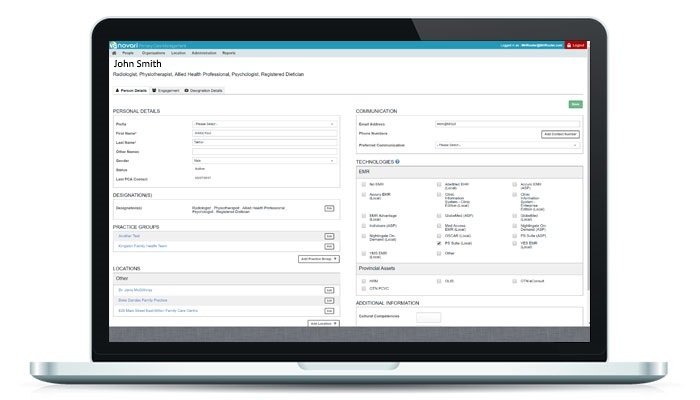 The Novari Provider Relationship Management module includes rich functionality for these field staff to update, track and communicate with their assigned roster of primary care physicians. The software also includes management features to allow the regional health authority to understand the field work being performed by their liaison staff. With hundreds if not thousands of clinicians in a region, it is very difficult to keep track of every contact with every primary care physician. The CMS, or contact management system functionality of the Novari Provider Relationship Management module allows regional health authority staff to document every contact, virtual or physical, with every primary care physician. Such CMS systems are common in most other industries, but not widely used by regional health authorities – until now. Regional health authorities have important ongoing information to share with the primary care community, such as new clinical programs, etc. Keeping track and monitoring the performance of each of these campaigns can be challenging. The Novari Provider Relationship Management module includes functionality to create individual campaigns, delegate key tasks to staff and track the campaign’s successes and challenges. The system can send messages to individual physicians, groups of physicians or broadcast messages to all physicians via fax, email and even SMS text messages (in accordance with a physician’s communication preferences). 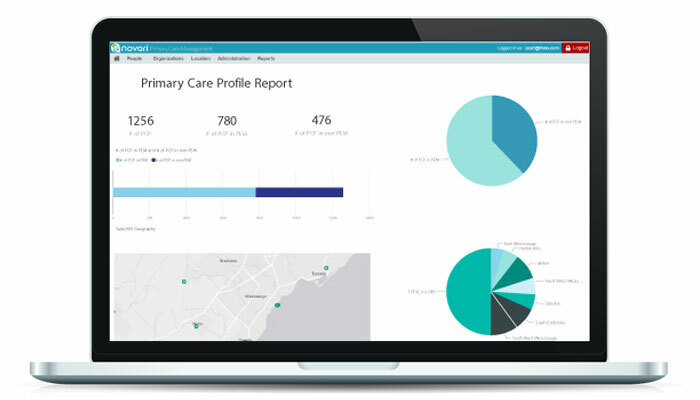 With powerful dashboard analytics, dive into the data that matters to produce actionable information, enabling faster decisions and transparency across the entire health region. Novari Provider Relationship Management uses 265-bit end-to-end encryption and meets federal and provincial privacy legislation requirements. The data is secured in Canadian Microsoft Azure datacenters.